Math finals tomorrow! Oh boy, I’m excited. Based on the polls, I decided to change the names of the characters from Chinese ver. to the Korean ver. After Jo Gi Chun’s math lecture, Cho Ryu Hyang left Peng Ga Ho, who was complaining about how much his legs hurt, and went straight for the library. After a quick ID check at the entrance, Cho Ryu Hyang entered the library, and was instantly greeted with the familiar smell of paper and ink. Indeed, it was peaceful and quiet here. Other than Cho Ryu Hyang, there was no one inside the spacious room he was in. Cho Ryu Hyang enjoyed this kind of peacefulness. Here at the library, there were still countless mathematical books to be read, and reading them was Cho Ryu Hyang’s only hobby, as well as a daily commitment. From a young age, Cho Ryu Hyang loved to solve mathematical problems. And as his clan happened to be closely related to the government works, he naturally came across mathematics, which he happened to be suitable for him. As long as you use the right algorithm, you always get the right answer. How appealing was that? If it was anyone like Peng Ga Ho or Un Geuk Lin, their faces would pale at the sight of it, but to Cho Ryu Hyang, mathematics was a fascinating subject that ceaselessly provided him endless joy. Cho Ryu Hyang’s eyes seemed to sparkle as he stared at the countless books packed into the bookshelves of the library. His eyes moved to the bottom corner of the bookshelf, where all the old math theory books were gathered, and tilted his head in curiosity. There was a old, worn out book that had one of its corners stuck out. He walked to it, and looked at the title of the book. It was a book with a overly flashy name. It was a title he never heard of before. Normally, a book this old would be copied by someone else by hand, and it would be put into the archives. Most of the books in this building were like this. The originals were usually written such a long time ago, there was barely any of them here. It was rare to see an old book in the library. That’s why his curiosity was aroused. He found something quite rare, after all. He sat down on the floor right where he was standing. And then he opened the book cautiously, fearing that he might rip the paper. This was the introduction of the book. It was written in a relatively clean, and beautiful style. 『Every kind of measurement that exists in the world is created by mankind. And using those measurements, humans are able to measure how heavy or how big an object is. It was quite an interesting subject. Cho Ryu Hyang already knew most of what the author was talking about. Becoming well-versed in the art of measurements was one of the requirements a good king should possess, as the nation relied on it greatly to perform tasks. Therefore, there were many books regarding measurements. Because of this, Cho Ryu Hyang knew quite a bit about measurements already. He turned to the next page of the book. Percieve the world with numbers? Cho Ryu Hyang’s head spun when he read that. Usually, he would’ve stopped reading a book like this here. But the writing had a mysterious persuasive power to it. After thinking a bit more, Cho Ryu Hyang turned the page. Cho Ryu Hyang looked like he took a hit. Didn’t he, too, think that the author’s ideas were crazy? He was only reading the book because the concept was amusing, not because it actually seemed plausible. It was a statement that made you see a little of the author’s arrogance. The author was right about that. Cho Ryu Hyang continued reading the next part. 『Following that, if the standard changed even by a little bit, the world would change tremendously. Cho Ryu Hyang thought about it a little. Indeed, the world wouldn’t be what it is now, if the measurements for the size and weight changed. 『This is what I want to talk about with the generations after me. Everyone looks different, their personality is different, and their hobbies are different. But because of that, anyone can become a standard, really. 『I was able to perceive the world in numbers. Every complications in the world, big or small, I was able to understand. I was able to understand any algorithm with just a glance. I was able to do anything that I would normally be unable to do. I was able to move ten miles with a single step, and if I started running, I was able to fly up to the clouds. Cho Ryu Hyang stopped and thought a bit. Wasn’t it enough to stop here? He was reading because this crazy talk was amusing to him, but reading more than this was dangerous. He could see that the author was getting more agitated. In the end, however, he was unable to close the book. He was curious what words the next page held. 『I thought there was no end to this power. But I got stuck in a bottleneck at the most unexpected place. I was unable to teach to others what I had learned. Even if it was me, this was an extremely daunting task. No one was able to understand what I was talking about. And I only realized why no one was able to understand my words when I neared death. Because everyone’s standard (worldview) was different, if I used my standard as the base of my teachings, no one except a person like me would be able to understand my teachings. Cho Ryu Hyang turned the page with a straight face. Why was this story in the mathematics section of the library? Perhaps the book was sorted here only because it had the word “math” in it. 『I didn’t want to be unable to pass on my teachings right after I gained insights, so I leave my teachings in text here. When he turned to the next page, he saw that the whole page was filled with numbers. Then he realized. The reason why the book couldn’t be copied was because of this numbers. No one could copy these numbers onto a different book when they didn’t even know what the numbers meant. Then, something amazing happened while Cho Ryu Hyang was staring at the numbers. There was a pattern to the numbers. When he realized that, his vision shook greatly. No, was it more correct to say that his vision distorted? 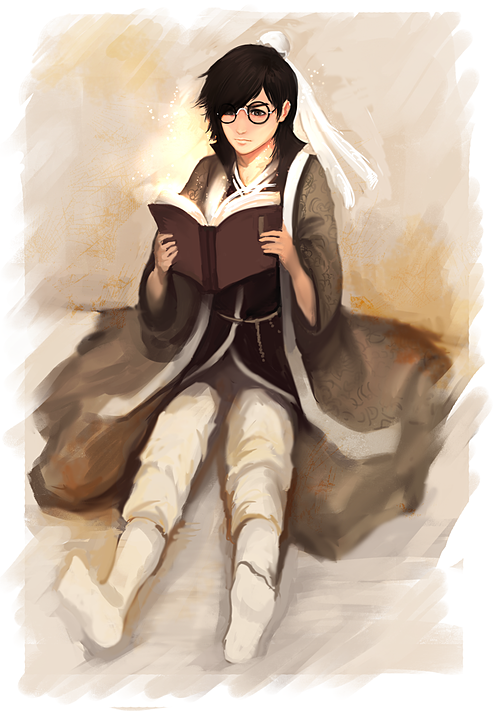 Cho Ryu Hyang took off his glasses, rubbed his eyes a bit, and looked at the book again. The numbers in the pages looked like it was twisting a little bit, and they all mixed together to become one mass. When he was looking at the papers of the book with great concentration, the number mass changed into some other form in front of him. A seemingly stubborn old man with a cold glare. Was this not a piece of paper with just numbers on it before? Then why did it turn into a drawing just now? An even stranger thing happened next. The old man in the book started talking. Cho Ryu Hyang was unable to speak, as he was too shocked to do anything. The drawing spoke again. The senior in the book looked at Cho Ryu Hyang with a piercing gaze. The gaze was so lifelike, it made Cho Ryu Hyang tremble a little. Cho Ryu Hyang realized then. This was not a mere drawing. The old man in the paper was alive. No, to be more specific, this was the consciousness of the author who lived in the past. Even if it was just magic, it was an astounding feat. But according to the old man, this was math. The old man was staring at the boy without saying anything. Cho Ryu Hyang thought a bit under this heavy gaze, and opened his mouth. Asking for a name politely from a book was a rather comical scene, but Cho Ryu Hyang was extremely serious at that point. This was purely guesswork, but if there was such a person like this, surely he left a mark in history. He needed to know the name of the man in order to at least be a little calmer, so he needed to ask this question to the senior. Thankfully, he got an answer immediately. The old man smirked, and opened his mouth. Cho Ryu Hyang had a dazed look on his face. The man in the paper was a much bigger existence than he realized. Was this not the name of the chancellor of the Shu Han, the legendary Zhuge Kongming? Cho Ryu Hyang thought this the moment he heard the name. If you look at the Three Kingdoms Book written by Luo Guanzhong, the chancellor of the Shu Han had a noble air about him the moment he appeared in the book. Starting from Liu Bei’s three visits, continuing to the battle of the Wuzhang Plains, and the event where he instructed his followers to use his own corpse to frighten away enemies. There were many famous stories originating from this man. Was he not a person of great achievements, both in historical and realistic terms? Most of his stories revolve around his genius strategies, but there were many other mysterious rumors about him that still existed to this date. If one looks at the Battle of Red Cliffs, where Zhuge Liang was able to create the Three Heavenly Formation Strategy, there is a part where he reads the heavenly words in the sky, and changes the direction of the winds in order to win the battle. Also, there are parts where he makes the Eight Diagram Formation to trap his enemies for an eternity. There might me some exaggerations in the story, but there are parts in the Romance of The Three Kingdoms where it is implied that Zhuge Liang did indeed possess mystical powers. Therefore, even if it was a figure who existed several hundred years ago, his words had power in them. Because of that, Cho Ryu Hyang was doubtful if this man was indeed Zhuge Liang. The old man’s cold, arrogant face underwent a great change for the first time. His face held a tinge of regret in it. Even though the individual himself confirmed it, it was quite hard to believe. This man was much, much bigger than Cho Ryu Hyang expected, after all. He had his own doubts, but he decided act like he believed the man for now. Unlike what he said, however, the old man promoted Cho Ryu Hyang from a “Greenhorn” to a “you”, when Cho Ryu Hyang addressed him as “chancellor”. His expression returned to the one of arrogance a little later, and talked while covering his mouth with a feather fan. A light came out of the book all of the sudden. Cho Ryu Hyang shivered a little when he felt that something was happening. The light changed into a 5-colored light and covered Cho Ryu Hyang’s entire body. With extreme heat, an astounding amount of knowledge flooded into Cho Ryu Hyang’s brain. It felt like someone forced open his head and poured in an immense amount of knowledge. When Cho Ryu Hyang was about to pass out from the intense pain in his head, he could hear the old man’s voice. After Zhuge Liang finished speaking, the thread of consciousness Cho Ryu Hyang was holding onto snapped. An immense amount of information that no one would be able to take in was forcefully shoved in. Looking at the collapsed child, the old man in the book talked. The man who revealed himself to be Zhuge Liang. He walked out of the book, and looked at Cho Ryu Hyang once. There were countless people who saw his book, but there were none who was able to understand it like this child did. The talent bestowed by the heavens. It was a different kind of talent he had, but it seemed this child had something akin to it. The old man’s power was so great, even “superhuman” was unable to truly show how strong he was. The power he left unto the world was equally great. But even he didn’t realize this great power would be given to a little child. The inability to see the future. That’s what made all this so interesting. He was unable to see the thing at the end, and died. He was so close as to be able to touch it with his hands, but his age prevented him to reach it. That’s why he did something like this. That’s why he left his consciousness for the future generations. He was being stubborn, for the first time in his life. However, we have a bigger Teach to teach! Teach more! Thanks Ensj!